I used to pride myself on cooking. In the summers we'd have just finished breakfast when we'd be planning who's on cooking and what's on the menu for the nights. And then Bodie came along, and over two years I've slowly withdrawn from the kitchen. Something had to give and for me, that meant handing over all adult meals to Dan or Seamless. But when I met Katie Witten during a play date with our boys, it's hard not to fall back in love with the idea of homemade food for the family. Katie runs Witten Kitchen, my go-to food and recipe blog because it brings to life her energy in the kitchen - she doesn't take it too seriously, she makes it fun for everyone around her and keeps it super efficient. One of her simple philosophies that's gotten me back to cooking (once a week to start) is her 1-2 Punch meal planning - dishes that work for your kids at 5 pm and then with tiny adjustments transform into something grown up for you and your partner to enjoy later on. It's been such a game changer for us that she's sharing more about her approach to feeding her family and three recipes to give it a try. By Katie Witten, a New York-based mother, founder and chef at Witten Kitchen and contributor to the MU community. Getting a healthy and wholesome midweek dinner on the table that everyone in the family will eat and actually enjoy is a feat, to say the least. To me, healthy means getting a well balanced, homemade meal with exciting flavors and ingredients that make your mealtime exciting and nutritious. Some nights this means I spend so much time in the kitchen cooking to every like and dislike of my small family that I become somewhat of a short order cook. So after many frustrated Tuesday and Wednesday nights, I decided to drop the job of everyone's personal chef, and start getting creative and force myself to do some planning ahead of time to make meals that can be both picky eater approved and make my husband and I just as excited to sit down and enjoy, preferably after everyone is in bed with a glass of wine in hand. Cue my 1-2 Punch Dinner Ideas. My favorite wholesome, homemade meals using creative ways of being time and ingredient efficient in the kitchen without compromising deliciousness for every kind of eater. For each dinner, I have 1 recipe that will give you 2 meals, one for the kids and one for the adults, using only a couple of extra ingredients or modifications. Sometimes the best way to get a family excited for dinner is to get them involved in making it. But with nonstop, busy weekday schedules, there definitely isn't always time to have everyone in the kitchen cooking. 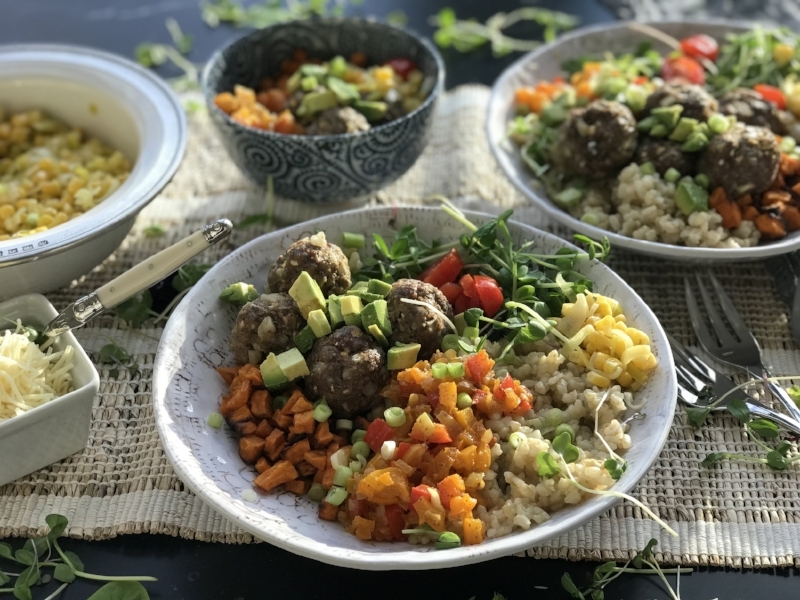 One of my favorite solutions is the DIY Buddha Bowl, which gives kids (and parents) a "choose your own dinner adventure" with options that you've made sure are healthy & delicious. I pick a theme (like Mexican or Asian) which help me plan a wholesome and varied spread of veggies (cooked or raw), favorite add-ins (like cheeses and sauces), a protein, and some kind of grain or gluten-free base (hey, cauliflower rice!). These mini Mexican meatballs are a crowd favorite because it's like eating a little taco, rolled up into a ball. Stacked with easy to cook and tasty Mexican spiced sides and additional add in's for every kind of eater in the family, these bowls ensure every color of the rainbow hits the plate and everyone is happy to join in putting together their version of a mini fiesta. Another way I make a versatile two in one meal is to find a protein that can be cooked the same way but in different proportions for the kids and the adults. With this dish, I crisp up and bake a lemon-y chicken piccata and pair it with a light and bright orzo and veggie salad that can is tailored to any kind of greens or fresh veggies your family prefers. For the little ones, I make the "piccata" into bite-size, chicken finger-esque pieces that are pan-fried and then baked alongside the larger boneless and skinless breasts for the adults or older kids. The sauce is so quick, versatile and seriously delicious that once you know how to make it, you'll want to use it in all kinds of mid-week meals be it winter, spring, or summer. Fresh, light, and easy to adapt are the keys to cooking for your family with less stress and time in the kitchen. This citrusy stir fry is my healthified version of a favorite delivery dish that can be amped up with spice or kept cool and bright for all different taste buds at your dinner table. With the addition of 1 simple, ingredient, gut cleansing, fermented kimchi, I add crunch and flavor for those more adventurous palettes. Mix and match with your own veggie favorites and seasonal greens, this easy and fast dish can be prepped the morning or day before, and quickly cooked in a wok or saute pan 20 minutes before dinner time. Serve with Asian style noodles or rice, make with chicken, steak, shrimp, or tofu, the sauces are super versatile.